On this page, we describe support for comparing Word documents using Eclipse. The purpose of this page is two-fold. First, we will described the goals and features of the Word Document compare support. After that, we will dig a bit into how we integrated the Word comparison with the Eclipse Compare framework. However, we are not going to dig into the OLE portion of the implementation. Go into the eclipse/plugins directory and find the JAR file whose name starts with org.eclipse.compare.win32. Copy the JAR from there and put it in the plugins directory of you Eclipse install. In this section, we describe what our goals for the Word document merge viewer were. We then describe the features of the viewer and show some screen shots of what the result looks like. Provide a means to save changes back to the Eclipse workspace. 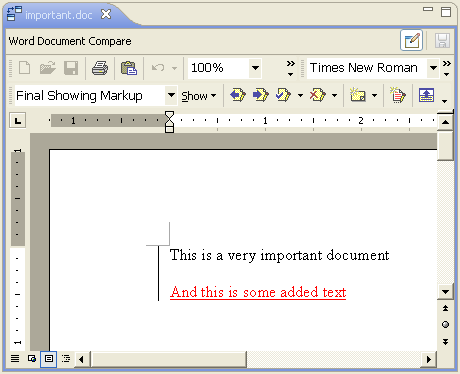 The merge viewer is associated with the "doc" file extension and a "Word Document" content type. The use of a content type will allow the user to associate other file extensions with the merge viewer. The merge viewer opens the Word based comparison in-place by default but there is a toggle in the toolbar that allows the document to be opened in a separate window. The following screen shot shows the word comparison in-place. You can edit the text and save in the compare editor which will save the result to the 'important.doc' file that is being compared. 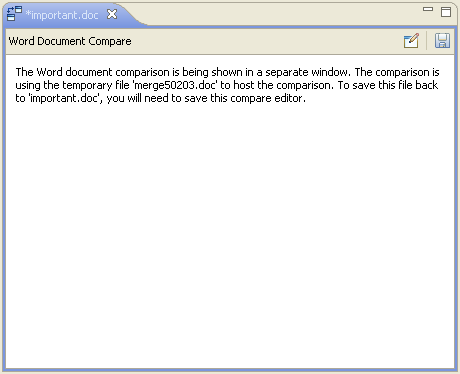 This next screen shot shows the compare viewer in "external" mode where the word document is open in a separate window. We don't have a screen shot of the separate Word application window since it is simply a full blown word application. Notice that the "In-place" toggle button in the above screen shot has been changed from the previous screen shot. Also notice that the editor is now dirty and the save action in the toolbar is enabled. The editor is dirty because we have made changes using the Word application. Even though the document is shown in a separate window, we are still keeping a link to the document so we know when it has been modified. Saving in the compare editor will still work (as indicated by the text that appears in the compare viewer). A limitation of the viewer is that it doesn't offer the ability to save if neither or both sides of the comparison are editable. For the "both editable" case, we didn't feel we could adequately present the save options in the UI. The workaround is to open the comparison in a separate window so you can then save any changes to any location on disk using the Word Save As menu action. We will now look at how to integrate a compare merge viewer into Eclipse using our Word compare viewer as an example. First we'll discuss the extension points we need to extend and then we'll discuss the compare viewer implementation. In the next section, we'll look at several aspects of the content merge viewer class. In this section, we look at how to define a viewer and embed it in the compare editor. In the first part of the section, we will look at configuring the viewer. In the second part, we will look at how to work with the input to the comparison and how to write changes back to that input. The following code snippet shows the definition of our viewer class. Notice that the class is a subclass of Viewer and implements IFlushable and IPropertyChangeNotifier. The compare editor can host any subclass of Viewer inside it's edit area. There are some specialized subclasses that clients can use: ContentMergeViewer and TextMergeViewer but for this example, we don't need to use these. These specialized subclasses are described further in the Eclipse ISV doc. As for the interfaces, we'll describe these in more detail later. The next part of the viewer we want to look at is the constructor. The following code shows the general shape of a compare viewer constructor. We set the CompareUI.COMPARE_VIEWER_TITLE property of the control to the title we want to appear in the toolbar above the viewer area. We use the CompareViewerPane.getToolBarManager(parent) method to obtain the toolbar of the viewer so we can add our buttons to it. We first need to clear the toolbar. We'll now look at the IFlushable interface. Bascially, this interface is used to indicate that the viewer has content that needs to be written back to the compare input when a save is requested. Our implementation of flush looks like this (we'll look into how we write the data back to the compare input in the next section). The second interface we implemented was IPropertyChangeNotifier. That interface is used to indicate to clients that our viewer can fire events (i.e. it defines add and remove listener methods). The main event of interest to the compare framework is the dirty state of the viewer. Whenever our dirty state changes, we call this method which fires a property change event to any listeners. That's pretty much it for configuring the viewer. In the next section we'll discuss how to manipulate the compare input. getLeft() and getRight() for getting the two sides of the comparison. There is also a getAncestor() that can be used when the comparison is 3-way. The LEFT, RIGHT and CONFLICT constants indicate the direction if the change. The direction is obtained by ANDing the kind with the DIRECTION_MASK. A result of 0 indicates a two-way comparison. This method returns true if we have an addition or deletion. We use it in our Word comparison to determine if we need to do a comparison or not. That is, for additions or deletions, we just open Word on the side that exists. If there is an IFile, we convert it to a local file and use that, otherwise, we try to extract the contents from the element using the IStreamContentAccessor interface. That is the essence of the code we need to open and populate the Word document (except, of course, for the OLE code but we are not going to go into that here). The only remaining part is how to write any changes back into the compare input. The first aspect of this is determining whether either side of the comparison is editable. The following snippet shows how to use the configuration parameters and the left element to determine if the left side of the comparison is editable. The way our save works is we write the edited word document to a temporary file returned by getResultFile() (i.e. wordArea.saveAsDocument(result.getAbsolutePath())). We then extract the bytes from this file and put them into the IEditableContent element of the compare input (i.e. saveTarget.setContent(asBytes(result))). Special thanks go to Duong Nguyen for providing the initial OLE code for opening and comparing Word documents. This page was last modified 10:25, 12 July 2011 by David Lafreniere. Based on work by Michael Valenta.